I thought that the method used for the Textured Elipse I posted recently may be of interest to some of the “new to turning” folk, it is realy quite a simple process but accuracy with setting it up in the lathe is esssential if you want to achieve a nice clean glue up at the finish. 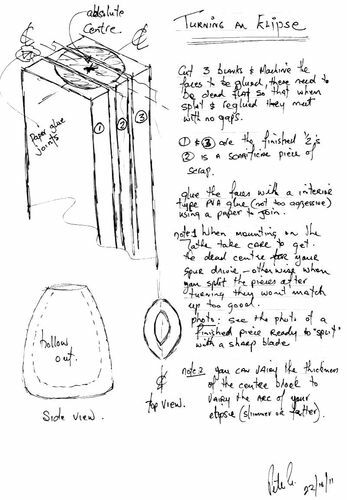 This is a very rough sketch showing the 3 pieces of stock used, the centre piece of course is a scraficial block, the glued edges must be true & dead flat or you will have gaps in the joint later. Thanks for that lot Pete,I thought it was joined but your gluing was to good to see. 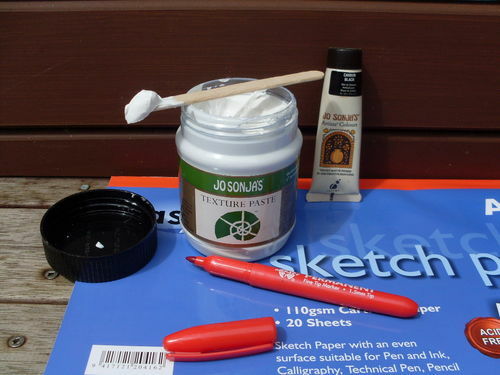 Have never thought of using paste so I am in the “new to REAL turning” group. Between your’s and Sam’s work there is so little I know. Haven’t got the rugby results but hope your guys do well, one day you will get the Betisloe Cup back. Hard fought game, nice to see your team won. Did I spell that cup wrong? Post op going well, got rid of the crutches, a couple more weeks therapy. Have a couple of projects underway and then must try the eclipse. 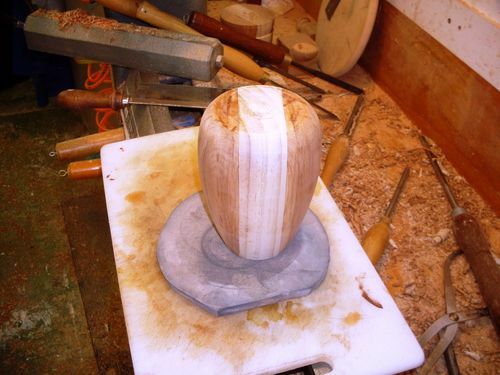 Did you see Sam’s blog on doing his ringed vases? Another one to try. Won an award at a craft show in Melbourne for one of my turned, carved and pierced projects, pick it up on 25th Nov. Enjoy the rugby celebrations Pete. Cheers Bob. ‘Dead flat’ and ‘Dead center’ – I guess those are some kind of metric measurements. I knew about turning with paper glued between layers, but never thought about vertically in a vase. Neat. New to me. Thanks for sharing Pete. I’m going to have to give this a try. Of course, now I see. 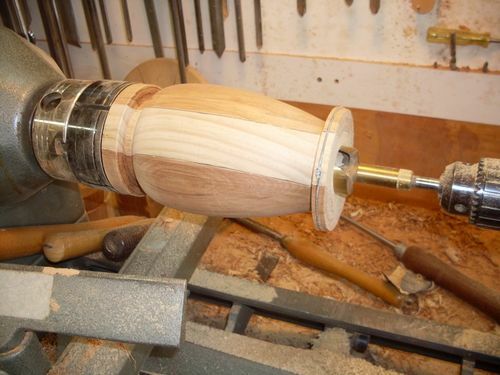 I’ve done split turnings before but only for shallow posts on a cabinet face in reproduction work. I suppose, maybe? you could cut out most of the interior of the sacrificial piece with a jigsaw prior to glue up, saving a lot of the hollowing work. Making an oval ring or doughnut as it were. If you make the centre block quite thick, split and paper glue the exterior pieces, turn only the exterior (no hollowing) and then split everything apart (rejoin) you could produce fancy high relief ellipses for applique. Got to try it. Thanks for the paste info and the very helpful photo’s. Clever idea, Pete. Thanks for showing us. I’ll have to try that one day. That is pretty slick. I like the paper idea for a dividing surface! Nifty idea! Thanks for posting and showing us new tricks. I’m not exactly a novice but I still have a long way to go to be in the “expert” class. 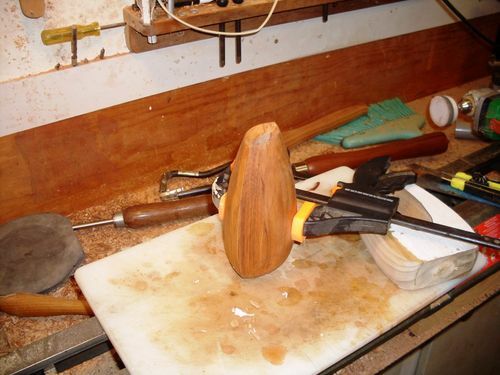 G’day Pete, I have been trying to figure out how I would go about turning a round, flat flask/vase and I think you have given me the key on how to do it. Thanks! For the next few months it it just be scribbling notes but come February/March I will give this a try. I am not a turner, but thought that this might be interesting to some people. I once visited the Old Schwamb Mill. It was fascinating. 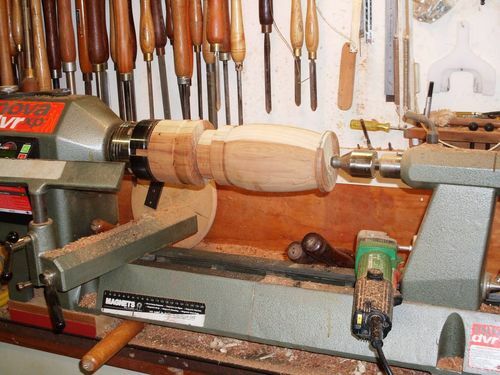 They have several eccentric lathes that were, and still are, used to make oval picture frames. 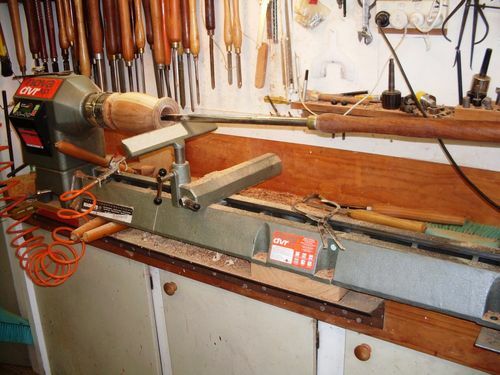 There is a description of how the lathes work here. One of the lathes is a massive device in the basement. It is a part of the structure of the building itself. When it gets running, the whole building seems to be shaking.